Located nearly in the center of Africa, bisected by the equator, the Democratic Republic of Congo (DRC) is a nation blanketed in tropical forest, the lifeblood of countless living organisms. Beneath its jungle canopy is a labyrinth of plant life—grey parrots flutter in the treetops, chimpanzees traverse the branches. In the shade of the forest floor is one of Mother Nature’s most unusual creatures. 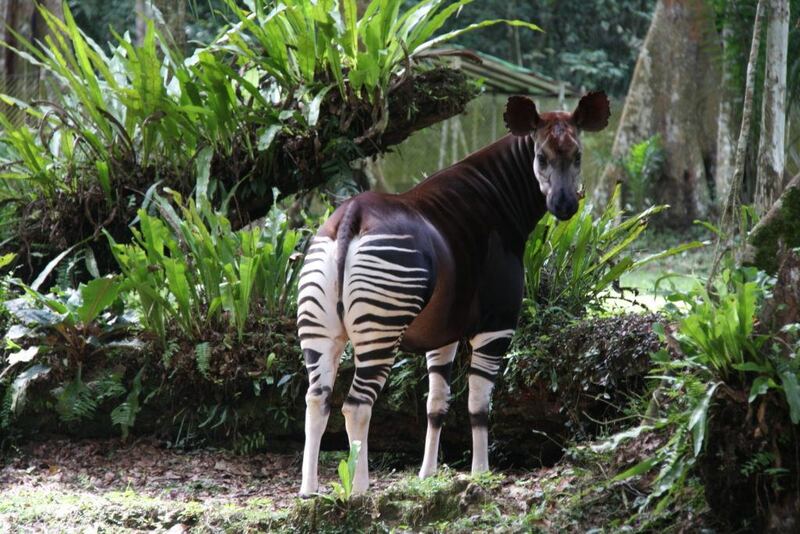 This is the only place on Earth where you will find the okapi. Okapis are unusual looking animals—a living patchwork with a mule’s stocky body, a zebra’s striped rear, and a giraffe’s exaggerated neck. Despite their unique appearance, they are extremely well camouflaged; their shy nature makes them even more elusive. Conservationists are not likely to see okapis in the wild; their best hope of observing them is through camera trapping. Lucas Meers of Okapi Conservation Project (OCP) has come to the DRC to do just that. Accompanied by OCP’s founder, John Lukas, a forest guide from the local Mbuti pygmy tribe, and a cadre of Institute in Congo for the Conservation of Nature rangers who patrol and protect the Okapi Wildlife Reserve, Lucas is here to help install a series of camera traps. Camera trapping is a key part of most conservation work, especially with animals that are difficult to observe. The OCP team can use images from the camera traps to learn more about the okapis’ population and behavior and to determine where they should concentrate their conservation efforts. OCP wants to use these particular camera traps to see if okapis are returning to areas of the forest where human activity has been recently eliminated. In silence, the group enters the forest at a fast clip, moving single file along a path so thin it’s virtually imperceptible. Their guide searches amongst the endless vegetation for the newly sprouted bright green leaves that okapis prefer to eat. This is the most strategic place to set up the camera traps, and it pays off. Weeks later, the team discovers that they have captured video footage of an okapi in the wild for the first time in OCP’s 30 years of operation. Over the next few months more images of okapi are recorded in different parts of the rainforest, indicating their population in the reserve appears to be stable. These camera traps will continue to gather vital observational information about the reserve’s okapi population—which will inform the rangers’ patrol strategy to protect this endangered animal and the millions of organisms sharing the rainforest with okapis.